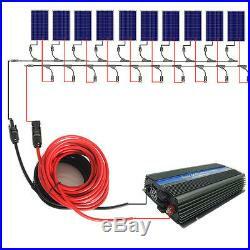 1000Watt grid tie system. This is 1KW solar panel grid tie system. 10x100W 18V poly solar panel with MC4 connector. 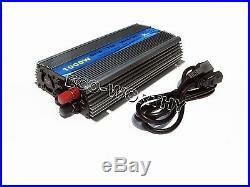 1 x 1000w 12V 220V grid tie inverter (We also provide 110V). 5 meters 4mm²extension solar cable with mc4 connector 5m. Red and 5m black. 1 Pair Y10 MC PV Solar Cable Branch Connector- FFFFFFFFFFM & MMMMMMMMMMF TUV MC4 connectors. 100W 18V poly solar panel, charge 12V battery. Short circuit current (Isc). Temperate coefficient of Isc. (010+/- 0.01)%/? Temperate coefficient of Voc. (0.38 +/-0.01)%/? Temperate coefficient of power Voc. Waterproof junction box, can be customized. 90% with in 10 years. 80% with in 25 years. Kind of glass and its thickness. Low Iron, high transparency tempered glass of 3.2mm. 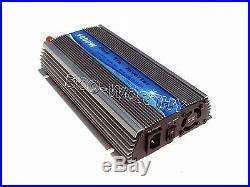 1000W 12V 220V grid tie inverter. Recommend solar panel power. Max input DC power. Max Output AC Power. AC Output Voltage Range. AC Output Frequency Range. DC Input Voltage Range. Total Harmonic Distortion(THD). Output short circuit protection. 0-99%(indoor use only). 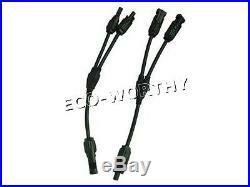 1 pair MC4 with 5 Meters extension cables TUV solar Pv cable UV and ozone resistant Red or Black 4mm². 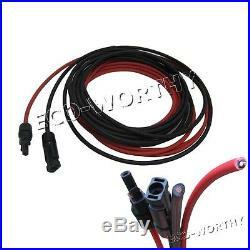 (5m red cable and 5m black cable). For movable, suspended or fixed installation in photovoltaic systems at temperatures ranging from -40? To +120? For use indoors, outdoors, in explosive areas, and in industrial, commercial, and agricultural applications. Suitable for use inside and connected to insulated equipment(protection class II). Ambient temperature up to +120? (movable and fixed). Designed according to IEC 60216:constant temperature 120? =20.000h(=2.3years), constant temperature max. TUV 2 PfG 1169/08.2007. UV and ozone resistant. Protected against short circuits and ground leakages. 1 Pair Y10 MC4 branch connectors. Brand new and high quality. With excellent aging resistance and UV endurance. Compatible with MC4 solar connector. It can be used in harsh environment. It does not need extra instruments for the removal of plugs. Removal will not cause any harm to plugs. Load capability with big current and high voltage. Good ability of resistance and machine shocking. Created seal, design of water proof and dust proof. Eligible plastic material has marvelous performances of high low temperature, fireproof , anti. Ultraviolet rays and applied to the long-time operation outside. T/T is welcome, please. Business is warmly welcomed. Company bank account of many currency such as USD, EURO, GBP. Is the best way for bulk order. We would be appreciated that you provide us with your bank information. Only faulty item return be accepted within 14 days after you receiving the item. Only new original item is acceptable, including any accessories, manuals. We won’t responsible for the damage items caused by force majeure. We are manufacturers and wholesalers of solar panels and renewable energy products. Business has been established since 2002. The solar panel producing capacity is around 300MW. We have sun simulators, laminating machine and supersonic glass washing machine to. The precisely solar panel for you. Our engineers are experienced in solar and related accessories. We have a professional customer sevice, trade, porduction and packing team. OEM and ODM services are both available. Wewould like to be your best supplier. We are now writing here with sincere wishes to establish long term cooperation with all the. Be the first to learn about new products and great deals by liking us on Facebook. Scan QR code, follow us Facebook. For any question at any time as long as you feel confuse. We work 7 days one week. Working time GMT+8 from 8AM to 5:30PM. Is not available for message reply. Here is the China Public Holiday list. New Year’s Day. 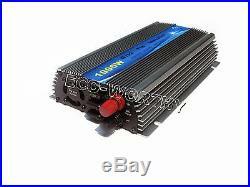 The item “1000Watt grid tie system10100W solar panel With 1KW inverter for home power” is in sale since Tuesday, June 23, 2015. This item is in the category “Home & Garden\Home Improvement\Electrical & Solar\Alternative & Solar Energy\Solar Panels”. The seller is “topsolar_china” and is located in CN. This item can be shipped worldwide.